My boots were caked with orange clay mud as I walked down the rocky, muddy road. Under my arm, I held three wooden planks and my right hand was occupied with a jar of nails and a hammer. I wore a black rain jacket, camo ball cap, blue jeans, and fairly worn brown cowboy boots. It had just stopped raining ten minutes earlier so everything was wet and the air smelled fresh and earthy. A rainbow decorated the sky. It reminded me of the story of Noah's ark and God's steadfast promises. After a couple of minutes of walking, I came upon a mighty oak tree whose sturdy branches reached out in every direction. "Perfect," I said with an approving grin. I gently laid my supplies down by the base of the tree and started to climb up it. The climb was rough with limbs poking me in the eyes and slick bark preventing me to climb with a sure grip. I thought of every tree I climbed as a challenge that I just needed to conquer. With every higher branch the urge to reach the top grew. I was just a couple of branches away from reaching the top when I heard something in the woods. I froze in mid reach. Suddenly, two options came to mind - either scurry up the rest of the tree or climb down to face whatever was in the woods. I chose option number two. As I half slid and half climbed down the tree, I could hear the fast, pounding sound getting louder. I couldn't decide whether I was being brave or dumb for doing this as I slid down the tree trunk and landed with a thud. The pounding sound was at its loudest and for a brief moment I thought I was imagining things. There before me was a rearing horse. It was clearly spooked so I stood up from my awkward position on the ground and started walking toward it with my arms outstretched horizontally. It acted as if it would keep rearing but it soon calmed down though it's eyes were still filled with fear. I started to rub it's neck and talk to it in soothing tones. "Where's your owner?" The horse was a strawberry roan appaloosa mare and roughly fifteen hands high. Her mane and tail were tangled in burrs. Her nostrils flared and her neck was wet with sweat. When she was completely calm I realized I didn't know what to do. I had just found a horse in the woods. I was racking my brain for a solution to my problem. In the midst of my thinking, I didn't notice a figure walking toward me from behind. "What!?" I spun around my heart beating out of my chest. The roan jerked her head up in alarm. In front of me was a boy with dirty blond hair and green eyes. He was roughly my height perhaps an inch or two taller. He wore jeans, a navy blue T-shirt and brown leather hiking boots. "Who are you?" I asked with a straight face. "Noah. I live on the other side of these woods. That's my horse." He pointed to the roan who was now nuzzling his sleeve. "Oh. Why was she out alone?" He gave his horse a quick inspection for injuries as I spoke. "She broke out of our paddock two days ago. Who are you?" "Kelley. Kelley Rosalind Price." He stood up and faced me. "Is your family the one who just moved here?" He bent down and picked up her hoof. "Uh, yeah. How did you know?" The boy's expression looked a little amused. "It's a small town. Thanks for catching Dakota for me. I'll see you around." He slipped a brown leather halter onto his horse and attached a lead rope. They left in the opposite direction leaving me staring at the mare with longing. I silently wondered if I would ever see them both again. For the rest of the afternoon, after Dakota and Noah had left, I built steps up the trunk of the oak tree. This was the beginning of my tree house where I would have many adventures. I had no more boards and no more nails therefore I decided to head back to the house. As I began to walk up the dirt road I thought back at what happened earlier that afternoon. The image of Dakota rearing was implanted in my thoughts. I wanted to see her again and stroke her beautiful coat. "At least I know where she is," I told myself. I knew she was with her owner Noah. I hoped that I would see them both again. The sun was gradually being blocked from view by a brooding cloud. I stopped and breathed in deeply through my nose. I could smell rain. I quickened my pace hoping to beat the rain I knew was coming. The sky quickly became dark and grey and rain began to lightly fall. I put my hood over my head and started to jog my way home. Lightning crashed in the distance. My heart jumped as I heard rumbling above me. The rain was now drizzling heavily. After a couple of minutes I could finally see my house in the distance. I sprinted toward it as the wind and rain blew in my face. I had reached the house and as I was just about to step inside I heard a yelp behind me. I turned around and searched the wide lawn with my eyes. Though I couldn't see anything I heard the yelp again. I desperately wanted to go inside out of the cold but I also wanted to save whatever was out there yelping. I stepped off the porch and headed out into the raging storm. On one side of our lawn there were trees and bushes. The yelping was loudest on that side of the lawn. As I searched I glanced upon something sleek and brown in the bushes. "What?" I pulled back the branches and set my eyes on a beautiful chocolate lab. I quickly scooped him up and ran inside. "Dad!" I said with excitement as I kicked off my boots in the laundry room. "Mom!" I hurried into the family room and held out the puppy in front of my parents. Their faces were shocked and confused. "Where have you been? Are you okay? Where did you get this dog?!" My mom sat up from the coach as she hammered me with questions. "I've been out exploring. You said I could remember? I was coming back but I got caught in the storm and then I heard something yelping and I found this dog!" "Kelley, go to the laundry room and grab an old towel. Take the dog to the sink and clean it off." I obeyed my father and did exactly as he told me. My parents sat at the kitchen table as I tended to the puppy. "Mom, Dad? May I keep em'?" My parents gave each other the "what do you think" look and sat there silently. "We'll think about it." My dad said breaking the silence. "Either keep it in your room or in the bathroom for the night." "Yes ma'am." I cradled the puppy in my arms as I headed up the stairs to my room. I gently put it on the towel in my bathroom then changed out of my wet clothes. I fell back on my bed and thought about everything that had happened that day. "Maybe living here in Good Hope, Georgia won't be so bad after all." "Kelley, I'm going to the store, I'll be back in thirty minutes!" My mom called out from downstairs informing me about her departure. I sat up in bed and looked out my bedroom window. The sun shone brightly with the promise of an exciting day. I got ready and headed downstairs and was greeted by the aroma of oatmeal coffee cake. There on the kitchen counter was a chewy piece laid out for me on a plate. I scarfed down my breakfast and quietly walked to my dad's study. He sat in his brown, leather arm chair reading a book. "Good morning dad. May I go down to the woods after I feed the dog and all?" He put down his book and stood up. "Actually, I already found the owner of that dog." I was surprised then confused. "One of the neighbors this morning called asking about a chocolate lab puppy. I told him we found one and that we would drop it off as soon as possible." "Oh." I followed my father out of the study with a small feeling of disappointment. I hoped that the puppy would be mine. I let out a sigh and went back to my room to get the dog. It still slept on the towel where I had left it the night before. A random cardboard box was on the floor so it seemed like the perfect way to carry the peacefully sleeping puppy. I slipped on my brown cowboy boots then briskly walked to the driveway where the pick up was already outside. I hopped up into the front seat as my dad cranked up the car. After a ten-minute drive with woods rushing past us on either side of the road, we drove up a steep driveway that led to a beautiful, quaint house with its porch decorated with delicate flowers. I was already opening the car door before the pick up came to a full stop. I walked quickly up to the front door, knocked twice, then took a step back. Suddenly, in the distance I heard a horse whinny. I froze and everything in me wanted to find the source of that whinny. Then the front door slowly opened and I was even more stunned than I was before. "Noah!" There standing before me was the boy from the woods. I suddenly gasped realizing that the whinny came from Dakota the beautiful strawberry roan appaloosa mare I had found the day before. We stood there in awkward silence for a few moments until my dad came walking up the porch steps. "Hi, I'm Carson Price. I believe this dog belongs to you?" My dad shook hands with Noah as Noah stepped out onto the porch. Before Noah could answer a man that looked like an older version of him appeared at the door. "Hello, I'm Blake Fowler." The man introduced himself and shook hands with me and my dad. As the two older men started to talk and lose themselves in that kind of conversation only adults can understand, Noah removed himself from the scene and came to me. "Do you wanna see Dakota?" My heart jumped at his question and everything in me was screaming YES! "Um, sure." I answered simply. I gently put down the box then followed him down a dirt path that led to a paddock where Dakota tranquilly grazed. He sat upon the fence while I simply stood on the bottom rung. "So, do you like horses?" He asked me keeping his eyes on Dakota. This was so downright awesome! Please keep going! I stood in the tack room alone with a feeling of disgust at myself. I got too comfortable, too soon, and just as I thought, made myself look like a fool. What's worse, I spoiled whatever thin connection of friendship Noah and I had. I angrily tossed the screws back in the trash and started to walk out but stopped. I quickly grabbed one screw and stuffed it in my back pocket. I left the tack room and immediately saw Jaylin, who seemed to be hammering Noah with questions about her twin. Natalie held her arm around Jaylin's shoulder, I guess trying to comfort her, but her voice sounded more sarcastic than calming. I spotted Levi, standing to the side, with a look of shock mixed with concern on his face. Everything in me wanted to retreat to the tack room but I bravely joined them without adding my voice to the confusion. "Jaylin, you're okay, calm down," Natalie baby-talked. It sounded very pathetic to me. "Look, Braden is fine, he's with your parents, my dad can call them and we'll figure this out"A very flustered Noah looked around for his father. Instead, Everly showed up and we all turned to her for direction. "Noah, your dad called your mom and she's at the hospital. They decided for Jaylin to go to your house until one of her parents can pick her up. The rest of you Mr. Blake will drive home." Everyone seemed satisfied and Noah gave Everly a look of gratitude. I kept quiet and tried to seem invisible. But it seems nothing passes Natalie. "Kelley, there you are! We're heading home." She rushed to my side and locked arms with me. My natural response was to jerk away but I forced myself to stay put. I gave an awkward smile and didn't respond but she didn't seem offended. I saw out of the corner of my eye Noah looking at me. I started to chew my lip, wondering if he hated my guts now. I pushed Noah out of my mind and let Natalie lead me to the van. We silently took our seats and waited for Mr. Blake. He arrived almost immediately and when he realized we weren't going to talk he turned on the radio. An Imagine Dragons song eased the awkwardness and soon Levi began singing along.Then Noah and even Jaylin. Soon all of us started half singing, half laughing song after song. We travelled around town first dropping off Levi, then Natalie, and finally me. I made a note of carefully of observing Levi's and Natalie's houses which were significantly different. Levi's was moderate, covered in hardie plank siding, painted grey. In the front was a rather small lawn surrounded by a white picket fence.The whole set up was quaint with a hint of modern to it. Undoubtedly, the array of mountain bikes in the grass caught everyone's eye. Perhaps, everyone except for Natalie. Levi gave us a quick goodbye and asked Jaylin to keep him updated on Braden. Natalie's house was just what I thought it would be: large and luxurious. A three story building decorated with stacked stone and sparkling windows. A vibrant green lawn and a long driveway lined with delicate magnolia trees added to the look of extravagance. The van came to a stop and Natalie piled out. Her cowboy hat fell off in the process but she retrieved it as quickly as she lost it. Between her hat and exchanging goodbyes Natalie didn't notice the mischievous looking boy creeping up behind her. He held his finger up to his mouth and in the other hand clutched a yellow water balloon. It was like looking at a boy version of Natalie but younger .His chocolate brown hair and deep brown eyes were identical to hers but his olive skin tone clashed with her rosy-pale. His arm came back, flew forward, the balloon left his hand but Jaylin and I were faster than his throw. "Natalie, duck!" We simultaneously yelled. As if she expected something like this would happen she dodged the balloon without hesitation. The balloon missed its target and instead ruptured on the driveway. She picked herself up, brushed off, and without looking at him said, "Maybe next time, Tim." With one last wave she marched inside. "That's Timothy her cousin. It's like his only mission in life is to annoy Natalie and her sister." Jaylin informed me as we pulled out of the driveway. "She has a sister?" I had always thought of Natalie being an only child and suddenly a wave of shame went through me. "Yeah, Tia. She's really awesome." I wanted to meet Tia. They must be pretty different, her and Tia, I thought. As we neared my own house something I hadn't given a thought to made me start to worry. My parents. This is going to be hard to explain, I thought. I immediately began to construct a little summary that carefully left out the broken branch, the tape recorder, and Noah's and my little spat. I didn't have enough time to completely prepare myself; we were already pulling into our cracked driveway. "Thanks, for the ride Mr. Blake. See you, Jaylin! Thanks for the invitation Noah." I wore a kind and confident face as I gave my thanks. I did everything within my ability to keep the calm confidence as I entered the house and gave my parents the vague play-by-play. "What's the last name of the boy who got hurt... Brandon?" My mother asked. "Braden. And his last name is Loveridge." "Does he have red hair, blue eyes and a twin sister?" She looked like she just made a scientific discovery. "Because, I met their mom last Sunday at church! I met their whole family actually; very nice people." The topic was soon switched and my parents began to talk about things I didn't really understand so I left. I collapsed on my bed upstairs hoping to rest but my mind was flooded with thoughts about my blunders that day. Am I overreacting? Should I be more worried? Do those kids think I don't belong? Probably. I just don't know. Your story is gripping. Please continue! We both looked down at the fallen branch. It had broken in two pieces as it met the ground. We took our time collecting ourselves; my head was whirling, my hands were shaking, our breaths came out short and heavy. "No problem." I took one more look at the ruptured branch. Noah could've been lying there beside it. I wondered if he was envisioning the same thing. "We should get down," I said. Without hesitation we made our way down, being weary of weak branches. When we hit the ground, Noah picked up the box and turned it around in his hands. His expression hinted some anger and I didn't blame him. This obvious prank was causing problems for himself, his mom, and his friends. He slid off the lid, handed it to me, and gently pulled out what looked like an old tape recorder. "Let me see the box." I took the box from him and examined it. On the bottom to one side was a rough cut out in the shape of a square. Noah then reached out for the box and we traded. The tape inside the recorder had a label that read: Velcro (Shadow Falls forest path). "Shadow Falls?" I glanced up at Noah. "This trail leads to a waterfall called Shadow Falls. It's called that cause it's rarely ever in the sun. Can I have the recorder?" I handed the recorder back and he placed it in the box. The cut out in the box was obviously meant for the recorder's square shaped speaker. "Where did the horses go?" I asked. Noah quickly looked around in a slight panic but calmed down when he spotted the horses in the trees. We walked over to them and mounted. I rode Tupelo with Newsie's reigns in one hand and Noah rode Dakota, clutching the box. We made our way to the stable at a slow walk because of Newsie but I didn't mind. "You never answered my question from earlier." Noah looked at me thoughtfully. "Ya, well I was kinda interrupted." We both chuckled but I knew he was going to want a real answer. "Um, it's better than I expected. Georgia is pretty different from Alaska." He gave me a look of shock one that said, "are you kidding me?!" "You're from Alaska!?" I threw my head back laughing at his reply. "What's it like?" Suddenly, the crummy events of the day vanished as we rode to the stable and talked like close friends. Our conversation weaved in and out of life in Alaska, my thoughts on Georgia heat, what Noah liked about Alaska, and universally known kid problems like grades, fitting in at school, and peer pressure. When we reached the stable, I offered to untack and groom the horses so Noah could find out about Braden and he willingly agreed. As I slid off Dakota's bridle, my mind began to drift again. But this time past adventures weren't occupying my thoughts. Instead, it was mysterious boxes, randomly breaking stall doors, old news articles, creepy figures hiding behind trees, and near-death experiences. Frustrated, I sighed deeply. Someone's idea of a prank was going too far. What if it wasn't a prank though? "Kelley, is that you?" I looked behind me and there stood Blake Fowler, wiping his brow with a ragged bandana. "Oh, hi Mr. Fowler." I took a hard brush to Dakota's coat. "Done fixing the stall door?" I asked. "Yep, it's all done. Not much to it." He stuffed his bandana in his back pocket and I thought this seemed like a prime time to find out some things. "So, what was wrong with it exactly?" I asked, continuing with my brushing. "Somehow, the hinges got loose. Pretty strange considering all the others were fine." "Ya, that is strange." I did my best to keep acting casual but red flags were waving in my head. "Why are you doing all this by yourself anyway?" He gestured at the horses and grooming supplies. So, I gave him an explanation about Braden's and Newsie's mischance and as soon as I finished he quickly thanked me, whipped out his phone and walked away. "Loose hinges, huh? That's convenient." I said to myself. I finished all the grooming and untacking and to my surprise Noah hadn't shown up yet. I took a hesitant step outside the barn and looked around. No Noah. I stood there awkwardly, not sure what to do when I remembered the fixed stall door. "Which horse's stall was it again... Ocean Muffin... Ocean something." "You mean, Ocean Cake?" I spun around and almost fell over. My cheeks were fiery as I regained my balance. "How do you do that?!" "Do what?" Noah said, as if everything was perfectly normal. "Never mind. Did you talk to your mom?" "Ya, she took Braden home and his parents took him to the hospital." "Good." For a moment we stood there silently, both of us had our arms crossed over our chests. "Were you going to look at the stall door or something?" My face was still hot and for some reason his question made me blush even harder. I was the new girl and I didn't want to look as if I knew everything already. Or seem as if I was making the stable's business my business. "Uh, ya if that's okay." "Sure. What for?" We walked to the fifth stall on the right. A wooden slot held a plastic tab, painted gold with the name Ocean Cake written in black Sharpie. "Um, I was just curious at how it might've broke." I squatted down and ran my fingers over the hinges. The black paint had been scraped off at places but Mr. Fowler could've done that. The screws that went through the hinges were silver and looked brand new. "Hey, Noah is there a garbage can in here?" "Ya, in the tack room." I stood up and walked to the tack room which was a cramped but organized room at the end of the barn. Noah pointed to a plastic bucket that sat in the corner. I picked it up and rummaged through the trash until my fingers wrapped around something small and metal. "Screws." I held out the screws for Noah to see. He picked one up and examined it. "It's dented." He grabbed the others and took his time looking at all of them. "They all have little dents in them." I said. "You're saying someone unscrewed them on purpose?" "C'mon, don't tell me you think the door broke on it's own." "I never said it did." He gave me a long look then handed back the screws. He seemed reluctant to admit that someone was trying to sabotage his mother's stable. I still couldn't shake off the nagging suspicion he knew something about this that I didn't. So, part 9 is out and I would LOVE to know what y'all think. I hope I'm keeping it interesting! I seemed to be paralyzed to my saddle. My head was screaming to take action but I couldn't move. Newsie was rearing, Chance, Tupelo, and Dakota were sidestepping all over the place and Braden was crawling backwards away from his horse. I forgot the concept of caution as I dismounted, ran to Newsie, snatched his reigns and held him until he stopped rearing. I was holding my breath and not until I realized Noah was by me did I exhale. He too had wanted to help with the situation. "Are you okay?" His hand softly landed on my arm and I felt my heart skip a beat. "Ya, I'm okay." I redirected my attention to Braden who was leaning up against a tree, cradling one of his arms. Mrs. Fowler was beside him asking where it hurt, how much it hurt, and that she would take him back. The horses relaxed but still looked ready to bolt if they thought they had to. A small trickle of blood ran down the side of Braden's head and I suddenly had a thought. What made Newsie spook in the first place? I looked around me. A breeze ruffled the leaves, birds chirped endlessly, the woods looked peaceful and undisturbed. It could've been anything, I thought. "Noah, I'm taking Braden back on Chance. You and Kelley bring the others." She heaved Braden onto Chance and mounted herself. They left leaving Noah and I in an eerie silence. The woods seemed threatening now unlike a moment before when they seemed tranquil. We stood there another drawn out moment and I started to wonder why Noah wasn't mounting Dakota to leave. "Aren't we going to go back?" He fiddled with his pocket knife and stared into space. "In a minute." He closed and shoved his knife back into his jean pocket then walked passed me to where Newsie had thrown Braden. "This doesn't make sense." I heard him mumble. He paced around, scanning the dirt, grass, and dead leaves. "What doesn't?" He had a serious look on his face, almost annoyed. "Nothing makes Newsie spook, except for one thing. The sound of Velcro." "Velcro?" This was just another bizarre event like the box in the loft, Levi's newspaper article, and the broken stall door. I almost refused to believe they were connected, these things only happened in mystery books. Noah was fidgeting with his pocket knife again. "The possibilities of Newsie hearing Velcro out here is-" He abruptly stopped talking and jerked his head up. Right above him was a small box hanging from a branch. It swung in the breeze and gave out the sound of ripping Velcro. Noah jumped and grabbed the first branch without a word. It didn't take long for him to reach the branch but attaining the box was more of a challenge. I sucked in a breath as he inched outward on the branch. He leaned forward on his chest, slowly slid out his knife, and attempted to cut the string. "Kelley, you'll have to catch it." He struggled to say. The string was giving way when we heard a snap. "Noah, get down! We can get to it some other way!" He ignored my panicking and with one quick slash of the pocket knife the box propelled towards my face. I caught the box as gently as possible, set it on the ground, and scrambled up the tree. With each creak and snap my stomach twisted. Noah sat at the base of the branch when it jerked and bent underneath him. "Noah, grab my arm!" He snatched my wrist and I hauled him onto my branch as the other plummeted to the ground. Two short but concise kicks, a forward motion from Tupelo, a trot so rhythmic and perfect it put a smile of approval on Mrs. Fowler's face. An assertive squeeze on Tupelo's side was like pushing a canter button. She responded obediently and we rode around the ring as if we had done it a million times before. Mrs. Fowler stood in the center of the ring, watching any mistake I made. It made me nervous at first but the sound of hooves, the motion of the canter, and the wind in my face made me forget all the eyes that were watching me. I slowed Tupelo to a walk, led her to the center, and watched as Braden and Newsie took their turn in trying to pass what Mrs. Fowler called the "Trail Ride Exam." All riders she planned to take trail riding had to pass this simple test. "Great work, Kelley, though your hands were a little stiff." She kept her eyes on Braden as she spoke. "Too stiff. Got it... but did I pass?" I waited anxiously for her reply. I thought back to my posture, my reign handling, my gait transitions... I kept my heels down, didn't I? I stayed loose in the sitting trot, right? I tasted blood and realized I had been biting my lip again. I have got to stop doing that, I thought. "With flying colors, Kelley." I quit worrying when I heard her answer and felt a gust of satisfaction and pride knowing Mrs. Fowler thought me a good rider. Braden seemed to be on the whole a natural rider himself. His form needed polishing but he led the horse with an easy-going confidence. "Hand down Braden!" Mrs. Fowler called out. He went a few more times around the ring, trotting and attempting to canter. He soon finished and joined me in the middle. Mrs. Fowler complimented and gave instruction on his riding but I wasn't listening. Something had caught my eye out in the pasture. A dark figure was ducking behind a clump of trees but I couldn't tell whether it was an animal or human. "But you did well, otherwise." I refocused on Mrs. Fowler. She was finished advising Braden so we left the riding ring to meet up with Noah, Dakota, and Mrs, Fowler's horse, Chance. "Here, mom." Noah handed his mother the reigns and they both mounted their horses. 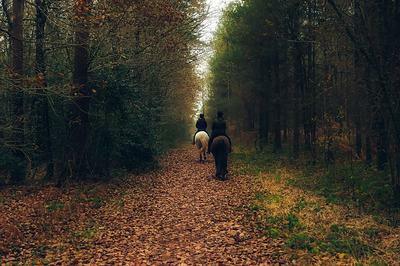 We rode through one of the pastures on a well-beaten path that lead to the woods. The boys kept up a steady stream of talking; mostly about shotguns and dirt bikes. As we rode along I tuned out and my thoughts began to wander. Memories from before the move came back vividly. There was one event in particular that struck me as we entered the woods. "You know I could beat you in my sleep!" "I'd like to see you try!" Darcy's buckskin mare, Pela, galloped inches from mine. I rode my favorite school horse, Jackson, that day. No one else liked him. He was stubborn, a complete mixed breed, hard to saddle, and had a tendency to buck. But, far from even my understanding, I wanted to ride him every lesson. We made a great team which made leaving him hurt even more. We galloped on through an empty pasture feeling the familiar thrill of speed and adrenaline. "Catch up, will you?!" I shouted over my shoulder at my best friend. She urged Pela on who gave a surprising burst of speed. They reached the fence first and I still remember Darcy's hysterical laughing. "I caught up with you!" Her voice echoed through my head and my heart suddenly felt achy. "Kelley? Earth to Kelley." Noah was riding beside me. He looked at me confused and I felt a little a little embarrassed for zoning out. "Oh, sorry. What did you say?" "I asked you how you like living here." I paused for a short moment. I didn't have to answer though because before I knew what was happening Braden was in the air one second and on the ground the next. MK Rider! Your work is amazing! You need to write more soon! You really have an amazing God-given talent! I'm so glad to be able to be a part of your life! In part 7, you'll notice that I put in a few new horses with interesting names. I would love to know which horse name was your favorite and which one was your least. Hope you enjoy! As Mrs. Fowler parked the van the anticipation was growing rapidly inside my chest. It seemed to take forever for everyone to unbuckle and get out but I managed to contain my excitement and keep my cool as my feet hit the gravel. "Okay, listen up!" Mrs. Fowler gestured with her hands for us to come closer. "This is Everly Clark, one of my stable hands." A girl who I guessed was two or three years older than me walked up. She had light brown, shoulder length hair, dark brown eyes, and a kind round face. She was dressed like a casual English rider, with her tan jodhpurs, tall, black boots, and a navy blue T-shirt. "Why don't Braden, Noah, and Kelley go with me and Natalie, Levi, and Jaylin go with Everly. That way we can help you all more easily." So, Everly took the other three to the stable and Mrs. Fowler lead us to one of the paddocks. "You three are a little more experienced so I'm going to let you ride some of my more advanced horses. When I say advanced I mean they've had extra training." But before we could reach the paddock something unexpected happened. From the stable came a thundering crash. We turned around to see Everly jogging in our direction with a shocked look on her face. "What happened?" Mrs. Fowler called out. "One of the stall doors broke!" Everly, panted. "I don't know! All I was doing was helping Jaylin tack up City Song when Ocean Cake's stall door broke off it's hinges." Mrs. Fowler gave out a deep sigh and mumbled something under her breath but her signature good attitude quickly resurfaced. "I'll just have to call Black to come down and fix it, I guess. Ocean Cake wasn't in there was she?" "No, she's in the pasture." Everything had happened so fast that none of us kids had said anything. I glanced over at Noah. He had a deep pondering look on his face and I could tell he knew something we didn't. Levi, Jaylin, and Natalie joined us at the paddock while Mrs. Fowler and Everly inspected the broken door and called Mrs. Fowler's husband, Blake. As if there was a magnetic pull between them, Natalie had once again made her way to Noah's side. "Does this happen often, Noah?" She asked in a soft, mature voice. "If things were normal around here, no." I wanted to ask him what he meant but I didn't get the chance. Everly and Mrs. Fowler came back and my attention was redirected back to horses and riding. But the whole incident was too coincidental to ignore. It was in the back of my mind now along with the article and the other mysterious box. As quickly as she could, Mrs. Fowler took care of the stall door incident by calling Mr. Fowler who came with his tools and work pants. "Sorry about that guys. Let's go get the horses you'll be riding." Everly, Jaylin, Levi, and Natalie left for the stable again and we three were each handed a halter and lead rope. Noah, without instruction, climbed over the paddock fence. Inside the paddock were three beautiful, fit looking horses. "Braden, you'll be riding Newsie. He's the palomino in the corner there." Braden too climbed the fence and walked over to a gorgeously groomed quarter horse, gelding. "Kelley your horse is Tupelo." She pointed at a blood bay, standard bred with a sleek, shimmery coat, and a thin blaze running down it's face. I eagerly climbed the fence and casually walked up to Tupelo. She held her head high a bit unsure of me, until I started rubbing her neck and talking in soft tones. As swiftly as possible I slid on the halter and clipped in the lead rope. I gave out a satisfied sigh and walked her out where Mrs. Fowler, Noah and his horse were waiting. I almost wasn't surprised when I saw that the horse Noah had was Dakota. MK Rider you have to write more! Please??? I am in love with this and I need to know what's in the other box! Mrs. Fowler greeted us with the warmest smile ever as we took our seats in the van. I hopped into the back and slid into the corner seat. Jaylin sat down next to me and gave me a sweet smile. One of the boys I hadn't met yet bustled in and sat down next to her. "Hi, I'm Braden." He reached over Jaylin's lap and shook my hand. I only then noticed his similarity to Jaylin. Same china-doll skin, same ocean blue eyes, same red hair, except his wasn't as vibrant and he didn't have any freckles. He flashed a pearly white smile and I suspected he was his school's heartthrob. "Kelley. Nice to meet you." Maybe he and Jaylin are siblings, I thought. "We're twins by the way." Said Braden. Well, that answered that question. My attention was then drawn to the three seats in front of us. Natalie was sitting beside Noah and the other boy was rummaging through his backpack. He was dressed in black basketball shorts and an Adidas T-shirt. His hair was a light, chestnut brown that was swooped to one side, probably from him running his fingers through it. He had dark blue eyes and was more muscular than either Braden or Noah. I bet he's an athlete, I thought. He quickly pulled out a small box attached to a string. Just like the one Noah and I had found. I couldn't help asking about it. "What is that?" He turned around to look at me but didn't quite answer me right away. He sort of stammered and couldn't look me in the eyes. "I uh, found this hanging from the gutter of my house." He turned the box around in his hand before it was snatched away by Braden. The box was thrown around by the six of us in confusion but Noah snatched it in mid-air cutting of Braden's hysterical laughing. "Dude, that was just getting good!" Noah ignored him and took a moment looking at the box, then casually lifted the lid. He slowly pulled out a crumpled, cut-out newspaper article with a headline which read, "Another Victim of the Burning Building Epidemic." He paused then read the article aloud. "Last night, 10.5.1963, Joseph Forrester's barn was set on fire. Police investigations concluded that the fire was set deliberately but have zero suspects. The calamity resulted in the destruction of several prized items including a newly purchased automobile, feed, and equipment for livestock and more. Police are devoting their time and resources into apprehending the person or persons, responsible for these continuous acts of vandalism." Everyone was quiet for a moment. Then Natalie who must've been uncomfortable with the silence said, "Are we going to look into this or something?" "Well, I want to. Here you go, Levi." Noah stuffed the article into the box and tossed it back to the boy with the basketball shorts. Jaylin, Braden, Levi, and Natalie started discussing the article but Noah turned around and leaned over to talk to me. "We should tell them about the other box." He whispered. "Go ahead." He got their attention and told them about our own findings. They were all shocked, naturally. "Wait, so there's another box?" Asked Braden. "Ya." But another question hung in the air. "So what was in it?" Noah gave me a quick glance so everyone, of course, turned to stare at me. "I never opened it. I'm sorry I just wanted to wait so Noah and I could open it together but I guess that was a stupid idea." No one said anything. And the silence made my stomach churn. I wondered what they thought of me now. I am so sorry it took me forever to write part 5! But it's out now and I would love to know what you think. Okay... Two words for you... KEEP WRITING! I love this story, the way you write keeps me on my toes and waiting for more! It had been a full week since I had had my little adventure at the Fowler's. Starting home school again took up practically all my time. I stared blankly out of my bedroom window, not in the least bit focused on my grammar lesson sitting on my desk. "Focus, Kelley. You'll never get anything done like this. "I scribbled down the answers, slapped my book shut and skipped down the stairs. I practically threw the book on the kitchen table for my mom to check my work. "What took you so long?" My mom, Karen, asked suspiciously. "I was distracted. Sorry." I jogged to the laundry room and pulled on my scuffed, brown cowboy boots. It was a clear, crisp fall day and no grammar lessons were going to stop me from enjoying it. I briskly walked down the dirt road behind our house. If I hurried I could finish building my tree house. At one section of the little road, it slanted up and you couldn't see over to the other side. Faintly, in the distance, I could hear voices. I stopped, listening intently. Kid voices. Realizing this I became nervous. I didn't do very well with strangers especially kids my own age. I lowered my head and kept my eyes fixed on my shoes and kept walking. My heart was pounding and I felt extremely anxious. Suddenly, "Kelley! Hey, Kelley! "I jerked my head up and looked widely at the boy calling my name. Noah Fowler. He sure gets around, I thought. He ran up to meet me. "Oh, hi! Uh, what are you doing?" I crossed my arms, already in defense mode but then stuffed my hands into my pockets. I didn't want to look rude. "My friends and I are going riding. Wanna come? "I didn't say anything at first. I wasn't prepared for his offer at all. "Um...wait why are you going this direction? Your house is that way." I nodded my head in the direction of his house. He had opened his mouth to explain when a girl with glossy dark brown hair walked up. Everything she wore was obviously brand new. She was dressed like a showy western rider but I got the feeling she didn't have much horse or riding experience. Or knowledge for that matter. "Noah, who are you talking to?" I felt seriously uncomfortable now. This girl was going to make me feel inferior. "Hi, nice to meet you." I smiled back shyly. "Hi, nice to meet you too." The three other kids that had accompanied them looked as if they were trying to decide whether they wanted to meet me or not. There were two boys and one girl. "Anyway, we're going to meet my mom downtown where she'll pick us up in a van and take us to the stable. We have a couple of extra seats if you want to come." "Let me just call my parents to ask for permission." I pulled out my phone and called my mom. She acted hesitantly but after a little reassuring, she gave me the permission I needed. I'm finally going to ride and actually make some friends! Man, I sound desperate, I thought. Meanwhile, Natalie, who had been complaining about the poor service she received at Starbucks the day before, turned to me and asked, "Well?" "Ya, she said I can go." As the words escaped my mouth I saw a lot of different responses. Noah seemed elated but was trying to hide it, Natalie looked indifferent, the two boys didn't seem to know what was happening, and the other girl shyly walked up and introduced herself. "Hey, I'm Jaylin." The girl was exceptionally pretty. She had china-doll skin and freckles. Her eyes were a bright ocean blue and her hair was straight and a vibrant red. She was thin, almost too thin for her age looking and a little taller than me. She wore a pastel purple T-shirt, black leggings, and black Nike tennis shoes. "Hi, I'm Kelley." I didn't know it yet but not being able to work on my tree house because I was suddenly going horseback riding with a group of small-town kids was the beginning of a whole new adventure. Of course we want another chpter! Note: The comment title is meant to be funny, not to be offensive. I would also like to hear from you whether I should write part 5!Thank you for the uplifting comments! Yes! Keep writing. Great job. Your writing ALWAYS blows me away! I love mystery stories and with horses in it tops it off! I love writing these types of stories, too. "Watch your step." Noah warned me as I climbed the rickety, wooden ladder that led to the barn loft. The floor of the loft was made out of wooden planks and once I stepped on them they slightly bobbled. There wasn't much light but what light there was streamed in from a little, round window on the wall. In the air, dust could be clearly seen in the sun's rays.I deeply inhaled the smell of wood, horse and hay, then sighed in content. "This is cool." I said looking around. Noah turned and faced me then opened his mouth as if he was about to say something. Suddenly,his gaze shot from me to something above my head. I blushed wondering if I had forgotten to brush my hair that morning. Without a word, he walked past me with a totally confused expression. "What... what is that? I asked as I followed his gaze to the ceiling. There, hanging from a bulky, wooden beam was a small, square object. "Um..." He searched the floor with his eyes then seemed to have found what he was looking for. He snatched a dusty, coiled rope from the floor and after a couple of tries slung it over the beam. The other end of the rope came down and I caught it. I then realized what he was planning to do. "Would you be able to reach whatever is up there if I use my weight to pull you up?" He seemed to know what he was doing so I simple nodded. I tied the rope around my waist and secured it with a sturdy knot I had learned from my father. "Ready?" Noah asked me as he took two steps back to make the rope taught. "Yeah." I grabbed the rope above my head and gradually felt my feet lift up off the ground. I glanced at Noah from the corner of my eye. He looked like he was struggling. I was now two feet off the ground and one foot away from the beam. I helped Noah by tugging myself up and onto the beam. "Can you reach it?" The hanging object was far out of my grasp so I had to lie down on my stomach and reach my hand out to grab it. I clasped my fingers around what felt like a small box and used my pocket knife to cut the string. I caught the box when the string gave way and lifted myself upright again. "Drop it and I'll catch it." Noah stood right below me and was holding his hands up to catch the box. I aimed for his hands and let the box drop. Noah successfully caught it and gently laid it down on an old, dusty tarp. "Okay, now hold on to the beam with your hands and swing your leg over. I'll make the rope taught and lower you down." I did what he said and we executed our plan strongly. I came back down from the beam safe and sound. "Kelley!" I heard my dad's voice coming from Noah's house. It was time to go home. We both looked at each other then at the box Noah was now holding in his hands. We unanimously turned and started to briskly walked back to the front porch where my dad and Mr. Fowler (Noah's dad) were still talking. When we got there a beautiful and cheerful looking woman was there as well. "Kelley we're about to leave but Mr. Fowler wanted you to meet his wife Aubrey." I shook hands with the radiant woman and felt very comfortable around her. "It's very nice to meet you, Kelley. Your dad tells me that you have some experience with horses." "Yes ma'am." I answered respectively not expressing how much I REALLY liked horses. "Well if you truly do like them and wish to be around them more often I really do need some extra help at the stable that I manage. I can pay you or give you riding lessons in exchange." My heart pounded and I want to whoop for joy! This was an amazing opportunity and I knew I couldn't pass it up. "I...I'd love to work for you Mrs. Fowler! And I would very much prefer riding lessons over money." "Great! Here's my phone number. Simply, call me and tell me when you have time and I'll schedule you for work." She handed me a piece of paper with her number on it written with beautiful handwriting. We said our goodbyes and headed back home. The whole way back I gazed out the window clutching the piece of paper in my hand and dreaming about working with the horses and riding one of them. In the midst of my thoughts the mysterious box came to mind. "I wonder what's in it?" I mumbled as I watched the trees rush past before my eyes. "I guess Noah and I will find out together." Part 3 is posted and I would love to know what you think of it! Tell me if I should write part 4 which will include the beginning of a mystery. Thanks for your encouraging comments! This is really good; please keep writing! I know I already commented, but it's just so good that I wanted to emphasize that you HAVE to write more. This is probably the best "book" on here. At least in my opinion. So PLEASE PLEASE PLEAAASSSE write more! Pleaaase write more! This is REALLY good! I'd love to read more. I love this story! Awesome writing style! This is great, MKrider! Please continue to write! Please tell me what you think of my story and if I should write part three. Thank you!